I took this photo a couple of weeks ago, in the old ducal palace in Dresden. The sign stands at the bottom of a narrow spiral staircase with – as it says – 222 steps. I snapped it because it made me think of some of the problems you can run into when you have your organisation’s words translated into another language. The German achtung Stolpgerfahr literally means attention triphazard. You might think that’s a lot less friendly than the relatively cuddly English translation, please mind the steps. You might also think that the English is a very bad translation of the German. You’d be wrong on both counts. 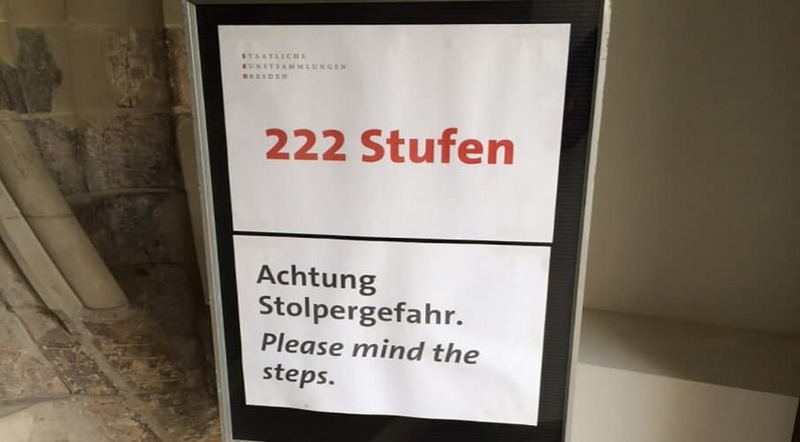 Although you’ll occasionally see ‘please mind the…’-type signs in German-speaking countries, seemingly bossy signs with words like achtung (‘attention!’) and verboten (‘…is forbidden’) are very common. German and English are related to one another, but they’re still very different languages, and people that use different languages tend to think in different ways. This is a complicated (and fascinating) subject, but, at the risk of vast oversimplification, German is rather a precise language, and the way it forms words and sentences encourages directness, frankness and logical expression. That’s reflected in German culture, which tends to value directness much more than English-speaking cultures do. Whoever translated achtung Stolpgefahr as please mind the steps did a good job, because he or she knew that while German speakers like directness, English speakers don’t like being bossed about, and will understand that something that sounds like a friendly request is actually a serious message. In case you think I’m making this up, there are plenty of good stories from English speakers living in Germany about how Germans see language differently. Check out this blog post from a gap year student, for example. A quick Google for something like ‘German directness’ will turn up lots of similar ones. It works the other way round, too. Germans, along with many other foreigners, often find English speakers maddeningly prissy and roundabout in the way they say things. We, of course, think it’s polite to be indirect and self-effacing. To many foreigners, though, it just seems like pointless mucking about. There are several reasons why English is like this. One of the most important is that our grammar doesn’t give us an easy way of expressing politeness and respect. Most languages (and nearly all the European ones) have built-in politeness tools in the shape of informal and formal words for the word ‘you’. Some, like Hindi/Urdu, have several ‘you’ words that you can choose from, depending on your precise relationship with the person you’re talking to and how polite you want to be. In English that’s not an option. As such – and for other reasons related to our culture, grammar and vocabulary – we’ve cobbled together all sorts of workarounds (‘do you think you could…?’, ‘We’d be grateful if you’d…’) to avoid the problem of being accidentally rude. To non-native speakers, this can sound passive-aggressive, insincere and even downright hypocritical. Not long ago someone even produced a handy table to illustrate, to non-Brits, the difference between what the English say and what they mean. Good translation is about much more than just looking up words in a dictionary, and bad translation can cause all sorts of problems. Good translators will do more than literally translate the words. They’ll put your message in the right idiom for a native audience, and help you deal with any cultural differences. If you’re getting your website or your brochures translated, try to get a native speaker to do it. So, if you’re having English translated into Italian, you should ideally get an Italian translator. Italian into English really needs an English translator. Beware of whizz-kids who claim they can translate into several languages. A good translation agency will manage this by spreading the work among several translators, but an individual is very unlikely to speak more than two languages with genuine native proficiency, and will probably get the tone or idiom slightly wrong. But what about Google? Surely it can translate stuff instantly, and for free? Well, it can, after a fashion – and it’s great for working out the rough gist of a piece of writing in a language you don’t understand. That’s about all it’s good for, though. Google can translate words and sentences quite easily (though its ‘translations’ are sometimes ungrammatical). But it has no understanding of the tone, idiom or intention of the writer. As such, it usually spits out a result that sounds terrible to a native speaker. You can prove this to yourself by visiting a non-English news website (say, www.spiegel.de or www.lemonde.fr) and cutting and pasting a story into Google Translate. The result will probably make sense, but there’s a very good chance that it’ll sound clunky or weird. That’s what your copy will look like to foreign readers if you entrust its translation to a computer. Translation is about much more that just working out the foreign word for each English word and slotting it into place. You need to understand that the way people think is shaped by the language they speak, and that any language translated very literally can sound odd or even offensive in another language. A good translator understands this instinctively, and has the imagination, knowledge and skill to take your message and make it really work for speakers of other languages. I would say the biggest mistranslation is omitting to tell the reader there are 222 steps. Some may not like to climb so many! I said to the gym instructor “Can you teach me to do the splits?” He said, ”How flexible are you?” I said, ”I can’t make Tuesdays”. Yep that’s a whole lot of steps. Thanks for the comment Richard. Hope to see more on translation soon. Thanks for the comment and corrections (oops) Sabine. Duly noted and changed! Thanks for the comment Deirdre.